The Mexican National Team just revealed their new away jersey. This means that Carlos Vela, Giovanni Dos Santos and the rest of El Tricolor are now ready to participate in the greatest competition in World Soccer - the FIFA World Cup 2010 - in South Africa. Official adidas México 10/11 Away Soccer Jersey! 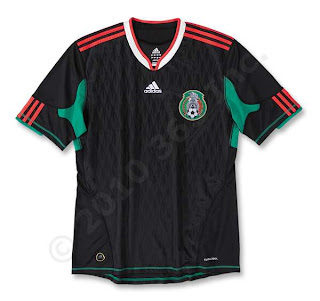 Unlike anything El Tri have ever worn, this unique new shirt is black, with green underarm panels, red and white collar and a neat sublimated diamond pattern on the front and back. MEXICO is on the back of the collar.